Smith, Burnett & Hagerman reaches back to Larned's frontier days. George W. Finney's practice in 1885 was the foundation of the firm. Finney was joined in the practice in 1933 by Maurice Wildgen. The Finney and Wildgen periods were the heyday of small town solo or dual practices. Glee Smith Jr. began his association and partnership with Maurice Wildgen in 1947, before Smith embarked on a long political career that included serving as President pro tem of the Kansas Senate. Don Burnett became a partner in Smith & Wildgen in 1959, and the firm became known as Smith and Burnett in 1963 when Wildgen became a District Court judge. The firm became Smith, Burnett, & Larson in 1975 when Jerry Larson became a partner, and then Smith, Burnett, Larson & Butler in 2012 when Jacque Butler was made a partner. 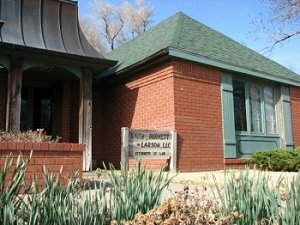 The old-new name, Smith & Burnett, LLC reflected recent retirements and departures when Ms. Butler became City Attorney for Derby, Kansas. In 2017, the firm became known as Smith, Burnett & Hagerman upon the addition of attorney Brenda West Hagerman.